Last updated January 29th, 2019. Please help and share this page. This page helps me keep this blog free for you to use - thanks! What is the best camera for food photography? Here is the quick answer to both of those questions. There isn't just one camera or lens that is best for food photography. These days there are 100's of awesome cameras to choose from that will work wonderfully with food. For lenses, see my pics below - there isn't just ONE lens for shooting food. Just like any other subject, you'll need a few lenses to cover all your shooting needs. So here is all the equipment I recommend for starting out, and all the equipment and software that I use (more advanced), plus a few accessories at the end. I am showing prices here of new gear. I buy a lot of used gear on Amazon and Ebay – just buy from a reputable store that allows returns for any reason without charging your a restocking fee. Disclaimer: This is not a sponsored post and I’m not being endorsed by any of these brands. They have no clue who I am. Some of these links are affiliate links and I will receive a small commission should you purchase the item at no cost to you. Please bookmark this page as I will be updating this regularly. Amazon changes prices almost daily so I do my best to keep this updated accordingly along with adding new products. I mostly use Canon gear for 35mm cameras but also have a Nikon because of the my Food Photography Club. We will also be talking about the newer mirrorless cameras as well as they are also excellent. Here is a great website to help you compare cameras. Camera Decision. You can compare five cameras at once. YOU BETTER KNOW WHAT A CROPPED SENSOR IS! I’ve learned that most bloggers and new shooters don’t know if their camera has a cropped sensor or not. A cropped sensor camera will take a picture using a smaller sensor than the full sized sensor. Why do they make these kinds of cameras? Well, they are less expensive to make, which enables them to lower the price for us all, yippee! Hold on there, what this means for photography and our lenses is a really big deal though. You see, the focal length of our lenses will have a perceived change on a cropped sensor camera, a lot! All your lenses will visually look longer than they are with your photos. This is called the Field of View Crop Factor. So, if you have a 50mm lens and slap it on Rebel T5i, your 50 will actually take pictures as if it was an 80mm lens from the same spot! Here’s how you figure this out with your camera. Google this, “what is the crop factor of (fill in the blank with your camera). This info is sometimes hard to find on the manufacturers websites as they can burry info several pages deep, so I just google it. Let’s use the Canon Rebel T5i as an example. The sensor crop factor is 1.6. So, take the focal length of the lens you are using, let’s say the 50mm lens, now multiply 50 by 1.6. This equals 80mm. Now, that’s like an entirely different lens! So let’s say you had a rebel and now you are upgrading to a full frame sensor camera – all your lenses will feel very different to you because now your 50mm lens will actually shoot like a 50mm lens, which is much wider than 80mm. For more info on cropped sensors and what you need to know when buying a camera, click on this post: What is the best camera to buy on a budget. File size - now most cameras have big sensors but for my commercial jobs, I need the biggest file size I can get. Cropped Sensor VS Full Frame sensor. For my "for fun stuff" I can use the smaller cropped sensor cameras. For jobs, has to be full frame. How many focusing points does the camera have? This is a huge deal for me, might not be for you. The more points you have the more focus options you have. How how of an ISO can the camera do without too much digital noise being added - very expensive and only pro cameras can barely do this. Some of these links are affiliate links. Should you choose to buy any of these items, I will receive a small commission. 1. Canon Eos Rebel T6i Camera Kit $630. The least expensive cameras are usually the kit cameras that come with at least one lens and in this case, all kinds of other things. With these kits, you are not getting the best quality lenses or accessories but it's a great way to start out to see if you really like this whole food photography thing. This kit comes with a small tripod three low quality lenses, a little flash unit, some memory cards, lens cleaning kit, filters, and a remote trigger. It has a touch screen, which is very handy to use. You can also see if you can get this refurbished from the manufacturer to save about $100. Crop factor is 1.6, it has 9 focus points, NO autofocus in video mode. 2. Nikon D3300 Camera Kit $548. Nikon's version of the kit above is the D3300. There is a newer one, the D3400 but it does not have auto focus with video so that is why I like this one. Again, with these kits, you are not getting the best quality lenses or accessories but it's a great way to start out to see if you really like this whole food photography thing. This kit comes with a small tripod (which you will be replacing down the road), three low quality lenses, a little flash unit, some memory cards, lens cleaning kit, filters, and a remote trigger and a few other things. Crop factor is 1.5, it has 11 focus points, NO autofocus in video mode. At this point you will start to have a number of cameras available to you. Most will have a cropped sensor still in this price range. I look at how many focusing points it has and if the video has autofocus. Also, check each manufacturers websites for pricing - something they have some refurbished bodies for great prices. 3. Nikon D7500 Camera Body $1147.This is a step up from the Nikon kit mentioned above. If you do video though, it doesn't have autofocus while shooting. You can manually move around your focus point while shooting, but that's it. What's awesome about this is how many focus points you get. Sensor size is also 24mp. Crop factor is 1.5, it has up to 51 focus points (depends on lens), does have a touch screen. I'm unclear if it has autofocus during video so please beware of that. 4. Canon Rebel T7i Body $700. This camera is still a cropped sensor but has the touch screen which is really nice to have for focusing both stills and video AND it has 45 focusing points, which is great. It has a large sensor at 24 mp. Crop factor is 1.6, it has 45 focus points, HAS autofocus in video mode, has touch screen. 5. 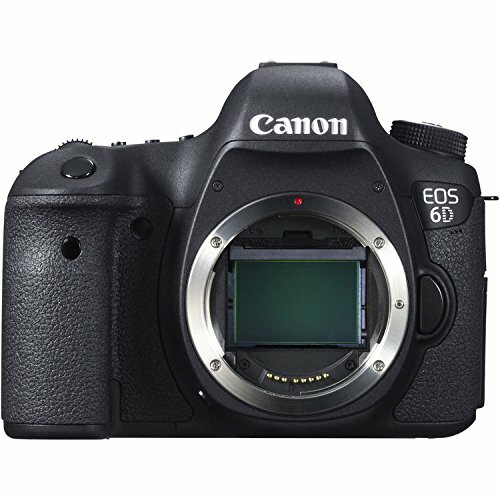 Canon EOS 6D $999.This is the lowest cost Full Frame sensor Canon makes. Please note that full frame sensor Canons cannot take the cropped sensor camera lenses, the EF-S lenses. You can only use the pro lenses on their full frame cameras, the EF lenses. That one letter makes a big difference. Full Frame Sensor, it only has 11 focus points, HAS autofocus in video mode, no touch screen. 6. Canon 5D Mark II + Zoom Lens Used from $1300. I have to mention this camera because I have used it for years. Canon stopped making this camera but there are some great deals on used ones. This is a full frame camera - it only have 9 focus points though but it does take great shots. It has 21mp. THIS IS A USED KIT WITH MY FAVORITE ZOOM LENS. This is used and comes with a used Canon 24-105 zoom lens. An awesome combination. Full Frame Sensor, it only has 9 focus points, NO autofocus in video mode, no touch screen. 7. Nikon D610 Camera Body by Nikon $1500.This is the lowest cost Full Frame sensor Nikon makes. Nikon's full frame sensor cameras do take the cropped sensor camera lenses, the only thing though is that your image will still appear "zoomed" in. They do this because the lens quality cannot handle the size of the sensor and you would see image degradation on the edges of the image. This kit is from Nikon - no lens included though. Full Frame Sensor, it can have 9, 21 or 39 focus points (depending on the lens used), HAS autofocus in video mode - you need to change it from AF to AF-F to use that, no touch screen. 8. Canon EOS 7D Mark II Body $1032. This is not a full frame camera but what I use for video for the Food Photography Club so I thought I should mention it. It's great for the price when doing higher end video. You can also find it refurbished for under $800 now. Crop sensor, it has 65 focus points focus points, HAS autofocus in video mode. 9. Canon 5D Mark III $2385.This is in middle section of cameras that Canon makes. File size is only 22 mp so for commercial work, this could be too small for some jobs. I have this camera and use it often for the blog here and for my personal photography testing. For jobs I use cameras with bigger file sizes. It's a great camera and a great workhorse. You can find deals on this used at Keh Camera. I buy a lot of gear from them. Full Frame Sensor, it has 61 focus points, NO autofocus in video mode, no touch screen. 10. Canon 5D Mark IV $2800.This is in middle section of cameras that Canon makes. File size is only 22 mp so for commercial work, this could be too small for some jobs. I have this camera and use it often for the blog here and for my personal photography testing. For jobs I use cameras with bigger file sizes. It's a great camera and a great workhorse. You can find deals on this used at Keh Camera. I buy a lot of gear from them. Full Frame Sensor, large files: 30.4 MP, it has 61 focus points, HAS autofocus in video mode, and has a touch screen. A great price for a lot of pro features. 11. Nikon D810 Camera Body $2800.This is in middle section of cameras that Nikon makes. Large file size at 36mp. This really is the minimum file size you will need for commercial work. Of course it's a full frame camera. Full Frame Sensor, it can have 9, 21 or 51 focus points (depending on the lens used), HAS autofocus in video mode - you need to change it from AF to AF-F to use that, no touch screen. There's an entirely new set of cameras now that the digital era made possible - the mirrorless camera or micro four thirds. To put is very simply, because of the digital chip, it needs less mechanical parts inside it so these cameras can be much smaller and compact. But don't let that fool you. There are some excellent mirrorless cameras out there. Here's a few that are very popular. There are now hundreds of models to choose from - thing is they are still a bit behind with all the lens options we want for shooting food, but they are getting there. You can use adapters with some brands to use your pro 35mm lenses though so lots of folks are doing that for food photography. Olympus OM-D EM1 Mark II $1999. This also has a 20mp sensor and it has a crop factor of 2. I actually have an older version of this. The Olympus lenses are very sharp. The images are noisy at high ISO though. Crop Factor of 2, it has 121 focus points! It HAS autofocus in video mode however, it's really hit or miss. just like the other OM-D models. Fujifilm X-T2 with 18-55mm Lens $1500. This has a 24mp sensor and those that use it love the color of their food shots. There a lot of members of my Facebook group that use this. Crop Factor of 1.53, it has 91 focus points! It HAS autofocus in video mode however, it's not very good and keeps searching for focus on still object, no touch screen. Sony A7 II with 28-70mm Lens $1200. This has come down a lot in price. This also has a 24mp sensor and it's has a full frame sensor! Pretty cool for a small mirrorless camera. It handles high ISO very well and the focus is supposed to be great on moving objects. Full Frame sensor, it has 117 focus points! It HAS autofocus in video mode however, it will try to find focus in low light, which I find most cameras have this issue, no touch screen. Every manufacturer has two types of lenses, a Pro series and an Amateur series, or Consumer grade series. Pro lenses are sharper and cost more money. Consumer grade lenses are cheaper and not nearly as sharp as the pro lenses. It’s like diamonds people, the more money you spend, the better clarity, color, and sharpness you get. Zoom lenses are known for being softer (not sharp) than fixed lenses and if you want a zoom lens, you really should invest in a Pro zoom lens, if you can afford to. For every brand of lens, pay attention to every single letter and number in the title of the lens. Just one letter can mean the difference between the pro lens and the consumer grade lens. Canon uses the L for their pro line. For Canon nomenclature see the Canon Lens Abbreviations on Photography Life. Nikon doesn't have one specific naming convention for their pro lenses. The do us DX for cropped sensor lenses and FX for full frame lenses so that's handy to know. For a full list of all the Nikon nomenclature see Nikon Lens Abbreviations on Photography Life. These are my favorite lenses to put on my full frame sensor cameras. The general rule for food photography is you use wide angle lenses (anything less than 50mm lens) for overhead shots. For tabletop 3/4 view shots, you need longer lenses for shots where you are closer to the food. If you want to show an entire scene on a table, then you can use the wider angle lenses here as well. 1. Canon 24-105mm f/4L IS USM Zoom $780. This is probably the lens I use the most for shooting overhead shots in the studio and also when I'm shooting out at a farm and need the convenience of multiple focal lengths. I am using this on my full frame cameras. Canon makes a pro version of this that should be sharper but you'll pay about $1100 for that. That lens has the "II" added to the name. It's a newer lens that is supposed to have smoother and faster focusing. The focusing mechanism is different in the newer version. This is a great lens to look for used as it's been around a long time and should be under $600 used. 2. Canon EF 100mm f/2.8 Macro USM Lens $600. This is my favorite fixed lens for 35mm food photography. Even though this is the consumer level lens, it's very sharp. I've been very happy with this lens. I am using this on my full frame cameras also. Canon makes a pro version of this that should be sharper but you'll pay about $850 for that. That lens has the "L" and "IS" (image stabilization) added to the name. It's a newer lens that is supposed to have smoother and faster focusing. Also great for portraits. This is a great lens to look for used as it's been around a long time as well and should be under $400 used. 3. Canon 70-200 f/4 L IS USM Lens $1100. This lens is a big heavy lens, but it takes great portraits. If you shoot for restaurants, you will be asked to shoot chef portraits. I also use this for shooting video close up shots on a two camera video set up. This is a great lens to look for used as it's been around a long time as well and should be under $800 used. 4. Canon TS-E 90mm f/2.8 Tilt Shift Lens $1400. This lens is incredibly sharp. It can be used to get a very large depth of field to get almost everything in focus for your shot, which is needed a lot for commercial work. You can also use it for the opposite - make an extremely shallow depth of field with just a tiny portion of your shot in focus. Though it's not a macro lens, you can get very close to your food. The only problem is that it is NOT auto focus. You have to manually focus this bad boy and with bad eyeballs like I have, you have got to shoot tethered to do that to make sure you got your shot in focus. If you plan on doing food photography for a living, this will be a must have. The price of this lens has never changed. It's always $1400. Now let's talk about the lenses that would be great for your cropped sensor cameras. If you are still using your kit lens, you must know that the quality of that lens is not good at all. I always suggest to upgrade your lenses as soon as you can. I'm not going to mention any of the cheap, bad quality lenses here. 1. Canon 24-105mm f/4L IS USM Zoom $740. I'm mentioning this lens again in this category because it would be an excellent lens for a cropped sensor camera. You can use this for overhead shots as well, even on a cropped sensor camera. This lens would be a great buy because you will still get lots of use out of it when you upgrade your camera body to a full frame sensor camera. Canon makes a pro version of this that should be sharper but you'll pay about $1100 for that. That lens has the "II" added to the name. It's a newer lens that is supposed to have smoother and faster focusing. The focusing mechanism is different in the newer version. 2. Canon EF-S 60mm f/2.8 Macro USM Fixed Lens $400. This lens on a cropped sensor would be like using a 100mm macro lens. It's very sharp and great for those 3/4 tabletop shots of one dish. The "macro" enables you to get closer to your food. The 50mm lens or the 18-55mm lens that comes with your camera, will not let you get as close to your food as you might need to get. Several of my Club members have this lens and love it. 3. Canon EF 50mm f1.4 USM Lens $350 Many bloggers tell other bloggers to use this lens for food photos because that is what came with their kit camera and that's what they are used to using. If you like your 50mm kit lens, then you really should upgrade it to a better quality one, and that's what this is. It is NOT a macro lens, so you can't get as close to your food as you would with the 60mm macro above. 4. Canon EF 17-40mm f/4L USM Lens $750 I use this lens all the time when I shoot video on my cropped sensor Canon 7D Mark II. It's a pro lens, sharp and though it's considered an "ultra wide" angle lens, on a cropped sensor it ends up acting like a 27-64mm which is handy for video. These are the lenses that would be great for food photos on your full frame sensor camera. Keep in mind I mentioned above the Nikon gear is more than Cannon gear. 1. Nikkor 105mm Micro f2.8 AF-S VR $900 This is an excellent lens. It's very sharp. I used to have one of these when I had Nikon gear. A great lens for doing 3/4 tabletop food shots of a dish and getting beautiful macro shots (micro and macro mean the same thing - you can get real close to your food). VR stands for vibration reduction. You should be able to find this used for under $600. 2. Nikkor 24-85mm f.3.5-4.5 VR Lens $500 This is a great zoom lens for doing overhead shots on a full frame camera body. You should be able to find this used for under $300. 3. Nikkor 24-120mm f4 VR II $1000 I'm mentioning this lens because it really would cover most of your needs for food photos. You can do overheads with this and 3/4 table top shots as well. The only thing is it has a minimum focussing distance of 18 inches so you can't do macro shots with this lens, but for normal table top work - it would be great. It won't be as sharp as the 105mm macro simply because no zooms are as sharp as a fixed lens. You can find this lens refurbished for about $600 as well. These are lenses that would be great with your cropped sensor cameras. Just remember when you upgrade your camera body to full frame, the DX lenses will still be "cropping" into your shot because of the lens quality. I'm not going to recommend any of the cheap, bad quality lenses here. 4. Nikkor 18-105mm DX f/3.5-5.6 VR $287 So this lens is a lens made for cropped sensor cameras so the quality is not a good as the lens right below this one. However, it's a better quality lens than the kit 18-55mm lens that comes with kit cameras. This range will work for overhead shots and for 3/4 table top shots. It's minimum focusing distance is about 17 inches, so you can't get real close to your food, but the zoom would help with that. You can find this lens used for under $200! 5. Nikkor 24-120mm f4 VR II $1000 I'm mentioning this lens because it really would cover most of your needs for food photos and it's for full frame cameras as well. You can do overheads with this and 3/4 table top shots as well. The only thing is it has a minimum focussing distance of 18 inches so you can't do macro shots with this lens, but for normal table top work - it would be great. It won't be as sharp as the 105mm macro simply because no zooms are as sharp as a fixed lens. 6. Nikkor 60mm Micro AF-S FX $600 This lens is great for doing those 3/4 tabletop shots where you get nice and close to your food. Micro means the same things as macro. On your cropped sensor camera, this lens would act like a 90. You can find this lens used for under $450. There are all kinds of options for lighting and it can be overwhelming. I'm just going to mention a few options here with links to more details about the lights. Different countries have different laws about our light sources now. So I'll be mentioning several different types because of this. Please see this post about the four different types of light we use for photography. 1. Westcott Photo Basics 403 uLite Kit and 20" Softboxes $250 This is a great softbox set. Yes, there are cheaper ones out there, but you really get what you pay for when it comes to softboxes. I have several of these and use these lights in my lighting class. You can use a 500 watt photoflood tungsten bulb (US only). It is made for high wattage light bulbs. This light is UL listed - that means it's safe and has been tested and certified as safe. All the cheap lights out there from China and Korea are made in such a way that they don't pass these safety tests and can't be UL listed, hence the price. They used to sell this light alone but now it's only available as a kit. For a small set up, you can use just one light. For a bigger set you might need two. 2. Sylvania Photoflood Frosted 500watts $6.00 This is for the US market only. This is the tungsten bulb for the light above. Please note - these lights are also called "hot light". They can get very hot. The color of the light is very nice. It's a 3200K bulb and the CRI is very high - which means it's a clean light, not green. These lights are cheaper than the LED's mentioned below, but they don't last very long so get a few at a time. Click here for more information on photo bulbs. 3. Westcott uLight 26 in Octabox $120.00 This is also a nice light as it "throws" more light on your set. So if you can afford the space, these are great to have. The larger your light source, the more light you can get over a larger set before needing to add another light. You can always cut your light off your set if your light is too big. You can't get more light of your box if it's not big enough. This does NOT come with the light stand. 4. Westcott 8 Foot Stand $35.00 Not all light stands are created equally. You must have a heavy stand to hold your lights. This is called a lightweight stand but it's a great stand that will support the Westcott light mentioned above and won't fall over. Don't get the cheap small stands. The base must be nice and wide to make sure your light won't fall over. 5. Westcott 50 Watt Daylight Balanced Fluorescent Bulb $42.00 each In some countries, these are the lights you might have to use. I personally hate these lights and here's why. Fluorescent lights have mercury in them so if you break one, you've got a hazmat situation for cleaning it up, seriously. Second, in order to get a bulb with a high CRI (color rendering index), you need to pay a lot of money for them. The cheaper low CRI lights have a very green tint - this means you can't mix these with daylight even though they are daylight balanced. Third, they are not bright so you need several of them to equal one 500 watt bulb. But again, in some countries, these are your only options. For more info on artificial lights - please see my free guide all about it. 6. LimoStudio 2 Packs Fluorescent Daylight Bulbs $29 These are the cheap, green lights I mentioned above. When the manufacturer doesn't advertise the CRI, that means it's very low and it's a green light. When they have a high CRI, that's something to brag about so they usually list it. Anything lower than a 92 will be a green light that your camera will have to color correct out. You cannot use this with daylight at the same time. When I say a "green" light, this is something that your eye won't see because your eye is actually color correcting the light you see all the time. Problem is our cameras DO see this light and need to compensate for it. 7. LimoStudio 4 Socket Adapter in 1 $13 Remember I mentioned above that the CFL's and LED's have much lower wattage? Well, this is how you get around that. This adapter goes into your light socket and turns one light socket into four. Now, keep in mind you have to pay attention to the total wattage you are putting into your light head and make sure to keep it under the maximum wattage that light head is rated for. Even though this is from the cheap Korean company, it IS UL listed and should be safe to use. 8. Phillips LED High CRI 60W Equiv $8 These are a good replacement bulbs when switching from tungsten to LED. These lights advertise that their CRI is 90, which is very good. You can also pick which color temp you would like to use. You can get the daylight balanced ones and use these with natural daylight in the room. For the price, they are great and they will last for years. These are an excellent alternative to both tungsten lights and fluorescent bulbs. The color temp is 2700K - not daylight. 9. Dracast Daylight LED Panels $583 These are pro level LED lighting panels. They have a high CRI and you can just put a diffusion gel on these to get a nice soft light. They have both tungsten and daylight color bulbs on the panel so you can change the wb on these lights as needed to match the color of light in your shooting area. For most of my commercial jobs I use strobes. The brands I use are huge strobe pack for quite a bit of money so I'm not going to list those here but there are some excellent strobes for those who are starting to up their game in their food photography lighting. These lights are called monoheads. That means that the head and the power pack are both inside the actual light head. You just plug it into your outlet. Some brands have battery operated ones as well. They can get quite pricey very fast but the ones listed below have been around a long time and loved by those who use them. There are loads of cheap ones on Amazon, but I am not familiar with them - just be very careful with the cheap lights. Don't leave them on and leave the room. I just don't want you to burn your house down. Please note: you will need to verify that what you are getting will work with your camera make and model. 1. Neewer Vision5 400W Monolight $369 These are set up to work with Canon cameras. They also make ones for Nikon. These strobes have their own batteries so this would be great for restaurant shooting. You can set your power on the back of the head in small increments. It's maximum output is 400 watt seconds (strobes refer to watt seconds instead of watts). You just put the guy into a softbox and you are ready to go. There are a TON of accessories made for these so it's very fun. This includes the trigger unit! Please check that it works with your Canon Model. Make sure to use Neewer strobe accessories to make sure they will fit on this strobe head. 2. Neewer Octogon Softbox $33 This Octa box should work with the light above. It's nice to work with a larger size box because you can always cut away light you don't need but you can't make it bigger is you need more. 7. Sekonic L 308XU Light Meter $220 If you use strobes, you will need a light meter to measure the light. It will save you time guessing how bright the light is. These are dots and fingers. They are made by Matthews. This is what you use to carve your light. You have several different little flags, nets, and scrims to soften, reduce, or block your light in specific areas in your image. You use C-stands to hold them in place. Once you start using these, you can't imagine not using them to carve your light. Fingers are rectangular and the circles are the dots. The finger kit is $246 and the dots are $60 for each kit. When selecting tripods, you have to consider three things. The legs – how high they will go, and how sturdy they are. The center column – geared is much better, as it won’t fall when you loosen it and possibly damage your camera. The head of the tripod – the part that screws into your camera. Some tripods come with a tripod head, but most do not. Be very careful falling for a cheap tripod that’s called a compact travel tripod. This will not be heavy enough to hold your camera, unless it’s a very small point and shoot camera. If the tripod is under $100, chances are it will not be heavy enough to hold your camera. I repeat – DO NOT BUY A COMPACT, LIGHTWEIGHT TRIPOD! When selecting tripod heads, you have to consider three things as well. Do you want a quick release head? – this means there’s a small plate that screws onto your camera, then that plate snaps into your tripod head. You will have to keep a screw driver handy or a quarter as these will loosen up while shooting sometimes. The other kind has your camera screw directly into the tripod head plate, my preference if available. Do you want a ball head or a 3- way head? A ball head uses a pistol grip, and when you press it, you can move your camera in any direction. A 3-way head enables you to move your camera in one direction at a time – horizontal, vertical, and swivel left or right. This is my personal favorite. Will you be shooting video? If so, you will have to get a smooth fluid head enabling you to move the tripod head very smoothly during video shooting. These are always more expensive, and a lot of these video heads will not enable you to shoot stills in a vertical format, fyi. 1. Manfrotto MKO55XPRO3 with 3-Way Head $320 This is a very popular tripod and this tripod head is excellent too. You can use this tripod for overhead shots because the center column can go 90 degrees. 2. Manfrotto MT190XPRO3 Tripod $175 This is the same tripod above without the tripod head so if you have one you already like, this could work with your tripod head. 3. Manfrotto MHXPRO-3W $133 This is the tripod head that is with the tripod in the first listing here. So if you have a tripod you already like and want a new tripod head, this is a great one. 4. Vanguard Alta Pro Tripod $110 This tripod is very popular with the food bloggers and it also tilts at 90 degrees for overhead shots. I personally do not like the ball heads because they tend to lose their grip over time. So you could use this with a different tripod head on it. 5. Vanguard Alta Pro Tripod No Head $100 This is the same tripod as above without the head, so you can put a better quality head on this. 6. Manfrotto Overhead Extenstion Arm $99 If you already have a tripod you like, you can use this to do overhead shots. 7. Heavy Duty Sandbags $17 If you are doing overhead shots, you will need to use some counterweight on your tripod. If you don't do this, your camera will fall over. I don't use sand in these. I use pebbles that I bought at home depot. And entire 50lb bag was $3. Or you can go to the beach and fill it with sand. Just make sure it is not wet sand as it can get moldy. I’ve been using Macs for 25 years. They were torturous hell in the beginning for photographers. If you wanted to run a Photoshop filter, you had to get cup of coffee as it would take 45 minutes, if it didn’t crash during that time. These machines have come a long way. These days, I now have four Macs. The computer I’m mentioning below is excellent for shooting tethered – shooting while your camera is attached to the computer so you can see everything as you shoot. There really is no other way to shoot in the studio or at home. How much memory does it have? The more RAM you have, the faster your machine can do certain laborious tasks. When purchasing your Macbook, make sure to see how much RAM comes with it. If you do video, you will need a lot. The other thing that effects performance is the speed of the processor. This is measured in Gigahertz or GHz. You will usually have a few options in processor speed when buying a laptop. Obviously, the faster the GHz, the better performance you can have, but you have to pay more for that. If you do video you will need a fast machine. Storage Size. The next option is to choose how much storage, or drive capacity, you want. I always get the biggest storage available. What ports and connectors does it have? These items seem to change daily. It’s very annoying. So if you want to plug a monitor into your laptop, you’ll probably need an adapter for that. The newest Apple machines now only have kind of port - the USB-C. You will most likely need to get a new cable for your camera to shoot tethered with the new machines. If you do video, the video card is very important. Basically if you get a machine that they say is super fast for gaming, then you'll be good for doing video on that as well. Apple 15" MacBook Pro $2500 You will have to get a computer of some sort. If you do get a laptop, you should also get a stand alone monitor to work on as well. This is the newer model than the one below. WARNING: with the newer Apple laptops, the RAM chips are permanently attached to the machine - no future upgrade options! I highly suggest you buy as much RAM as you can afford. 16 megs is the minimum for shooting tethered. If you do video, you will probably need more. Check apple's refurbished computers. I've bought almost all of my macs from their refurbished list on their website. This link is always on the very bottom of the apple home page in very small text. Apple 15" MacBook Pro $2000 You will have to get a computer of some sort. If you do get a laptop, you should also get a stand alone monitor to work on as well. Apple iMac 27inch $1800 I love working on desktops for color critical work. All my digital techs use iMacs or the Mac tower. It's a computer and monitor all in one. Check apple's refurbished computers for some iMacs. BenQ 27 inch 2K Monitor $600 This is a professional monitor for working on color sensitive work. If you plan on doing food photography for a living, you will need to get a pro monitor. X-Rite ColorMunki Display $150 Every monitor MUST be color calibrated or you are literally shooting blind. Your camera LCD is normally too bright, which will make you take pictures that are too dark because you are compensating your exposure to look correct on your camera's bright LCD. Same thing with monitors and laptop screens, people normally have them set too bright as well and the same thing happens there - making your images too dark. You cannot calibrate a monitor with just your eyes. You have to use a device like the ColorMunki. I've been using their devices since digital photography started. Their devices last a long time so once you get this, you'll be using it for years. Check out this post to show you how to calibrate your monitor. SanDisk Extreme Pro 64GB $25 These memory cards are so affordable these days. The prices do change almost daily. This is the SD card that goes into a lot of cropped sensor cameras and the mirrorless cameras. Double check to see what your camera takes. This is smaller than the Compact Flash, but the size has nothing to do with the quality of the data it stores. SanDisk Extreme Pro 128GB $131 This is the card I use in my cameras. It's great for video as well. If you do video, get the fastest biggest cards you can afford. G-Technology G-Drive USB 3.0 2TB $93 This is also a must have. If you don't back up your images, you will 100% lose them one day. It's not a matter of IF your drive will crash, it's just a matter of WHEN. I'm a freak about this. I back up everything as I'm shooting. I've had drives inside the computer go down during a photo shoot. Luckily because everything was backed up - we didn't lose any of our work that day. For tethering cords, get a few and get at least a 10 foot or 15 foot cord. Do not use adapter in them to make them longer. The more items you add to a connection, the more potential issues you can have. Please note the newer Apple machines have a new type of port to plug into. Hi-Speed USB 2.0 Type A to Mini B Cable 2 Pack $11 For shooting tethered, you must have cables to hook up your camera to your computer. PLEASE look at your camera, or google it to find out what cable interface you need. This cable is for using with the older apple machines. USB A to Micro-B SuperSpeed USB 3, 15ft cable $40 This is the other type of tethering cable I use - the USB-A to Micro-B SuperSpeed USB 3. This is for the Canon 7D Mark II and many other. Canon Remote Cable $47 You will also need to get a remote cable for your camera. You need to put your camera on a tripod, and use this cable to take the picture. You don't want to touch your camera during the exposure or you can have motion blur on your shot. You must make sure that what ever cable you get will work with your exact camera make and model. Wireless Remote Control for Canon $9 This is also very handy. A wireless trigger. I've used this on large sets where it was difficult getting back to the camera each time to take a shot. You must make sure that what ever trigger you get will work with your exact camera make and model. Adobe Creative Cloud Yearly Plan $120/yr This is how you get Photoshop these days. You have to buy into their Creative Cloud plan. If you do this plan though, you get all their updates for the same price and you get Photoshop and LR together. Capture One Pro 11 Photo Editing $300 This is the other software I use for tethering and editing my larger format cameras. Capture One Pro has been around for quite some time now and if you use a Phase One digital back, you will need this software to edit and tether with. It's much more stable than Lightroom! No crashing! Here's selection of some very popular photography books. 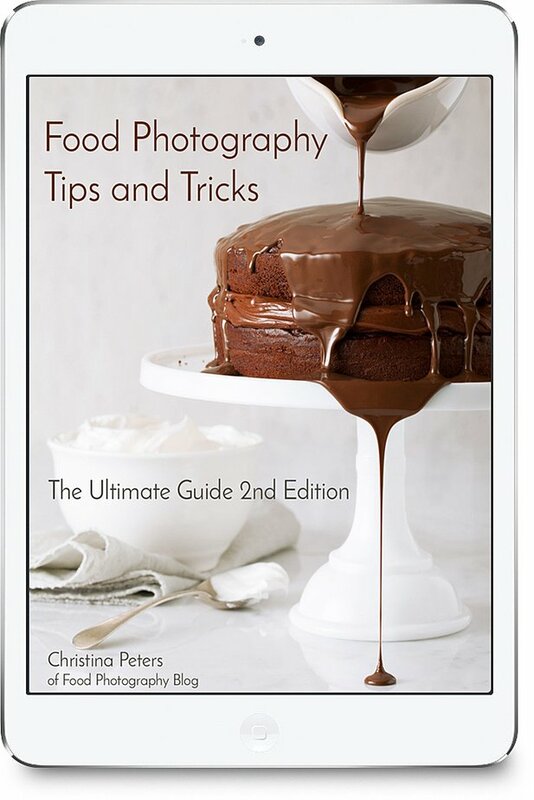 Food Photography Tips And Tricks; The Ultimate Guide $20 Did you know I have an ebook? It's 125 of all kinds of information about food photography so if you are just starting out, this is a great ebook to have. The Food Stylist's Handbook $17 This book was written by two good friends of mine, Denise Vivaldo and Cindie Flannigan. They are both food stylists and we have taught several food photography classes together. This book has everything you need to know about food styling. There are tons of excellent tips in here along with the business of food styling. I actually wrote the chapter about food photography. Please Note: The "look inside" pics are from the first edition - Amazon still hasn't updated that yet. Food Styling: The Art of Preparing Food For The Camera $56 This book was written by another food stylist friend of mine, Delores Custer. I had the pleasure of working with her in New York city when she was still styling. She has since retired but this book also has some great styling tips for your food photography. Food Photography: From Snapshots to Great Shots 2nd Edition $21 This book is now in it's 2nd edition and is a good book for beginners. Plate to Pixel: Digital Food Photography and Styling $28 This book is several years old so I'm assuming there will be 2nd edition soon but this is also good if you are just starting out. The author had a very popular food blog, then she worked full time for a publishing company, and now she's freelancing as a food photographer. She has a baking history and her images are very beautiful. You can get it used for about $15. If there are any products that you love that you think I should mention here, please email me and let me know.